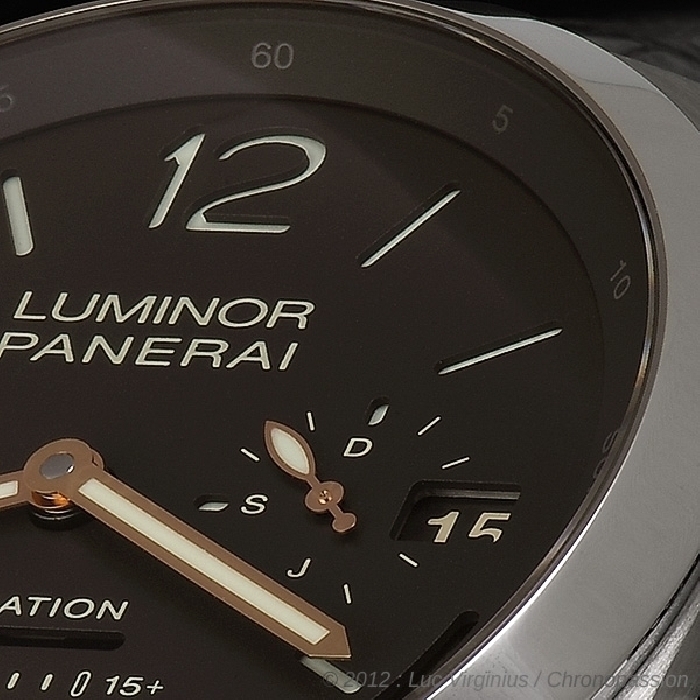 Panerai | 149'000 € Tax inc. Dedicated to fans of technical grand complications, the Luminor 1950 Equation of Time Tourbillon Titanio – 50 mm by Officine Panerai is a tribute to the genius of Galileo Galilei, a combination of some of the rarest, most exclusive and fascinating specialities in watch-making. 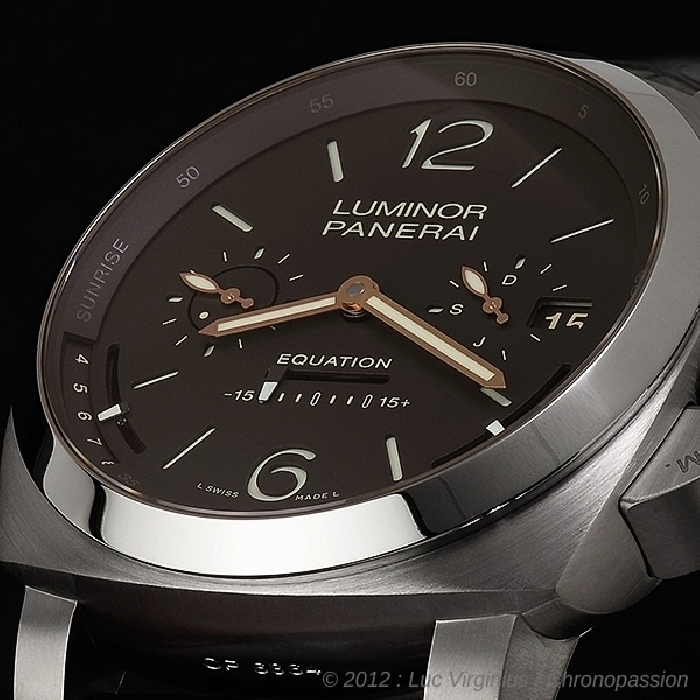 Produced in just 30 examples, the Luminor 1950 Equation of Time Tourbillon Titanio – 50 mm is the most technically sophisticated wristwatch ever produced by Officine Panerai: a tourbillon with equation of time, indication of sunrise and sunset times for the city chosen by the purchaser and depiction of the night sky of the same city on the back plate. 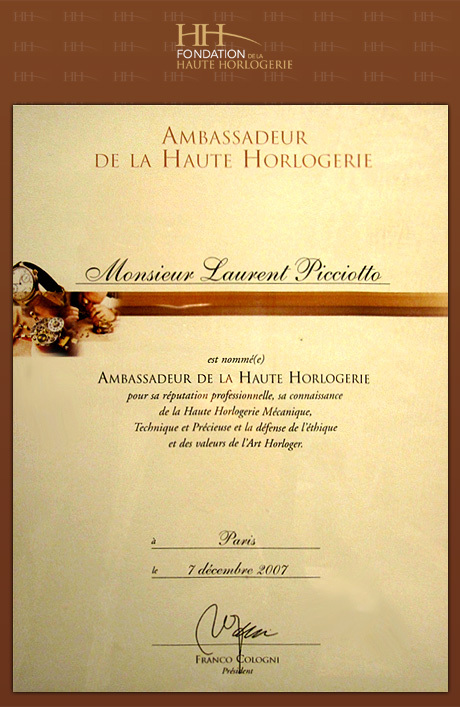 The watch functions are immediate and clear on the dial: a date window at 3 o’clock, alongside a tiny dial that shows the month with a hand; sunset time; equation of time; sunrise time and finally small seconds at 9 o’clock, where the rotation of the tourbillon with a tiny ecru disc is visible through a small dial. Times for sunrise and sunset are shown by two cursors that run along numbered circular sectors and vary depending not only on the seasons but also on the latitude chosen by the purchaser. 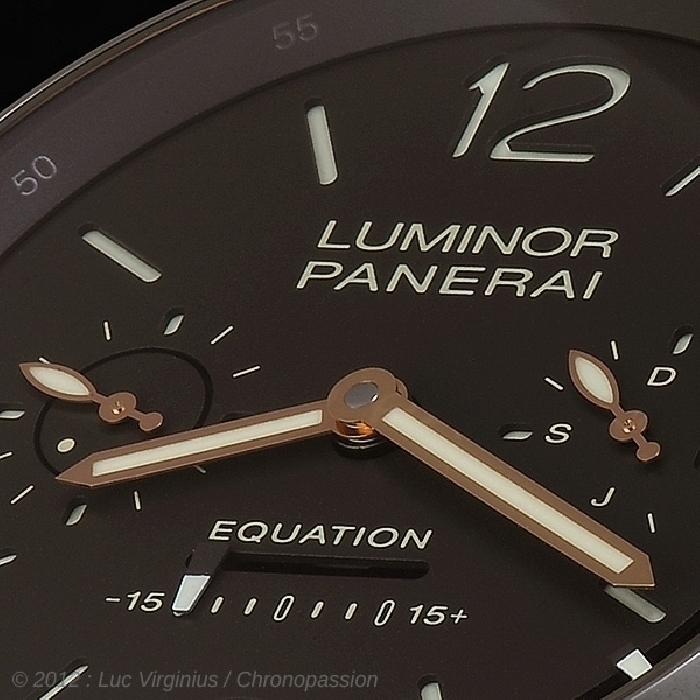 The dial has the classic Panerai sandwich structure, guaranteeing exceptional night-time visibility thanks to the luminescent substance inserted between the two layers. Equation of time is the difference between the time shown by the watch, which is that universally adopted for ease and real or solar time, which varies every day due to the eccentricity of the Earth’s orbit and the inclination of its axis. 4 days a year, these two times coincide perfectly but on all the other days they actually differ by up to 15 minutes, either faster or slower. 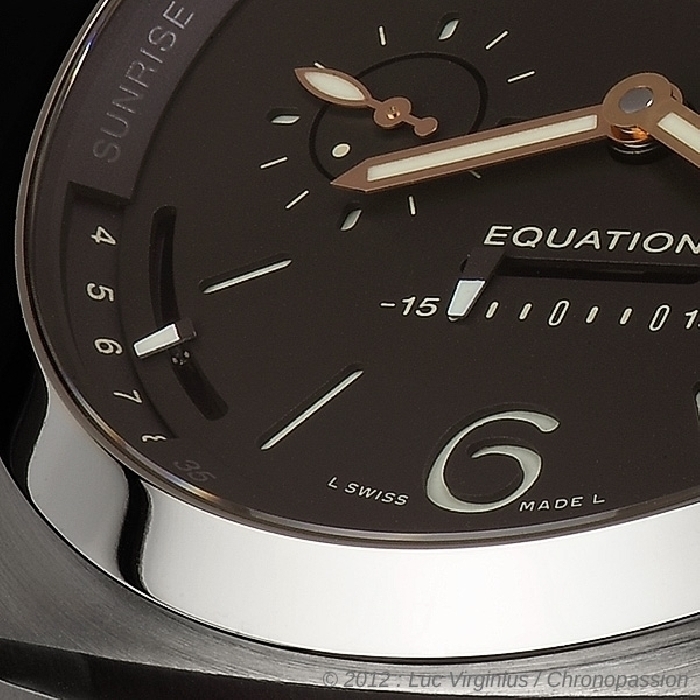 The linear cursor at 6 o’clock immediately shows this time difference and this calculation is a speciality of top-end watch- making and a feature that very few watches have. 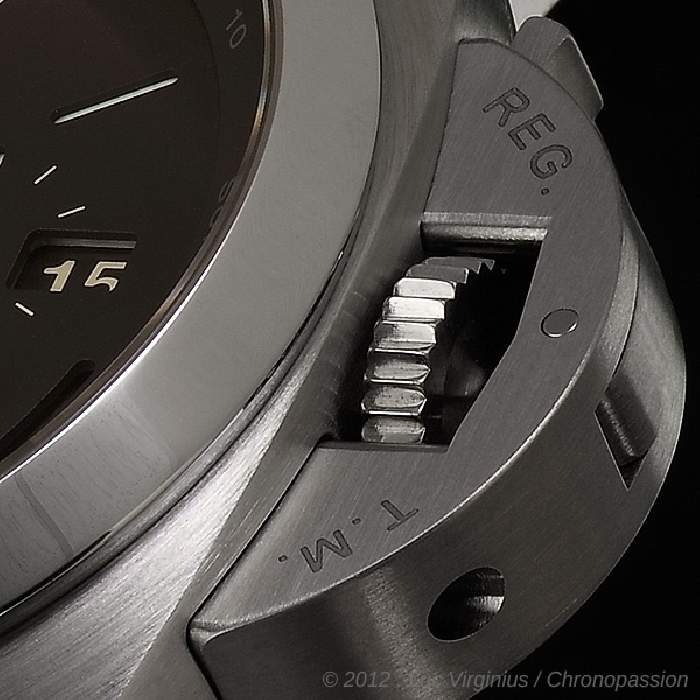 Other indications can be seen through the sapphire glass on the lower part of the movement P.2005/G, based on the Officine Panerai P.2005 in-house calibre, modified to include new functions. With 375 components, the P.2005/G calibre features a typical Panerai tourbillon regulator, which can be admired from the back, turning on an axis perpendicular to the axis of the balance and making two rotations a minute, instead of one. With three spring barrels, it has a manual-wound movement and ensures 4 days’ autonomy, with the remaining power reserve shown by a hand, this too visible on the back. 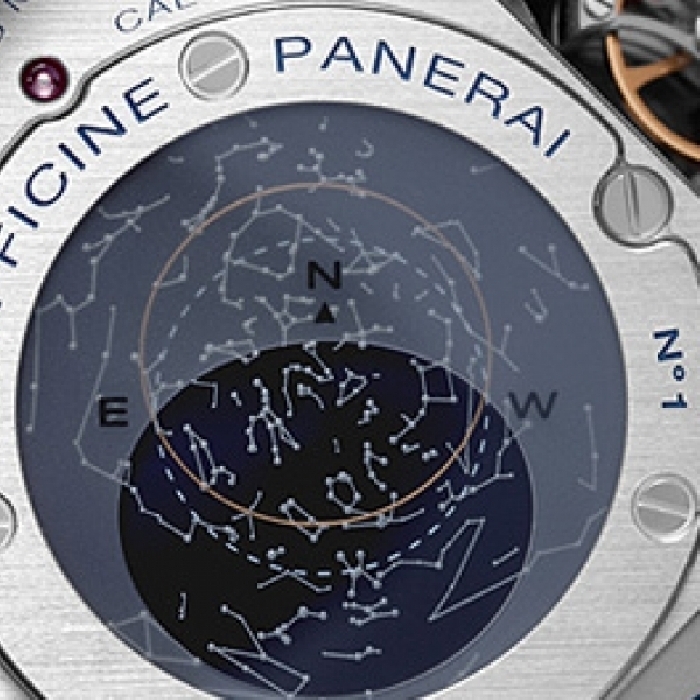 The last hugely fascinating element that completes the personality and refinement of this model, is the map of the sky on the lower part of the mechanism. The disc that shows the map rotates in one direction or the other, depending on the hemisphere chosen, thus constantly updating the night sky above the city chosen by the purchaser. The name of the city is also engraved on the back, together with the millesimation. The watch’s Luminor 1950 case is 50 mm in diameter, in titanium so that it weighs less, but clients can also choose a pink gold case. 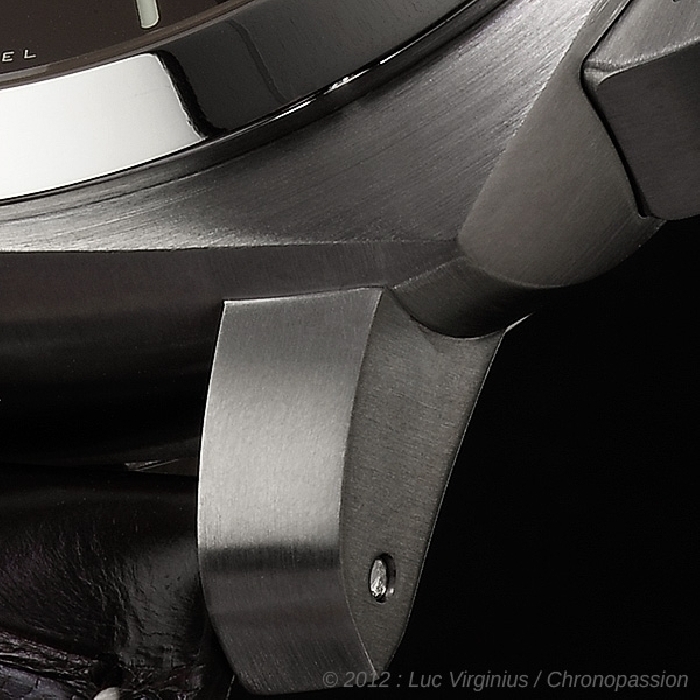 Waterproof to 10 bar (about 100 metres), the case has the typical crown-protecting bridge, brushed titanium like the case body, while the anti-reflective sapphire crystal is held in place by a bezel with contrasting polished finish. Supplied with a second interchangeable strap, a tool for replacement and a steel screwdriver.